I first got interested in making my own lotions when I started reading what was in the kind I was buying. Not good ingredients! I didn’t want to smear those chemicals over my skin, our biggest organ! And the natural lotions are so expensive! I started researching how to make my own and quickly got overwhelmed. The list of ingredients each recipe called for was mind boggling and expensive! And time consuming! Finally I found one recipe that made lotion making simple and I haven’t been able to stop making lotions, deodorants, face scrubs, and lip balms since. These recipes make perfect budget friendly gifts and I’ve included packaging recommendations and printable labels in the booklet! After you learn these simple to make recipes & techniques you’ll never have to buy beauty products again! So what’s in it? 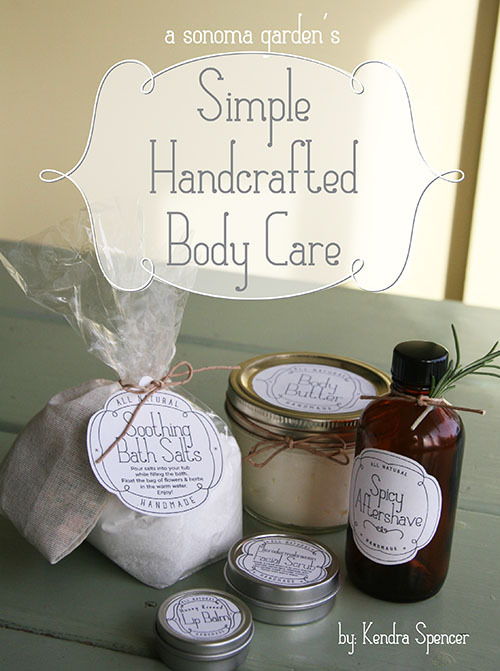 Well, there are five easy to make and basic body care recipes in here. There are no fancy, unheard of ingredients nor is there a long laundry list of things you need to buy. In fact most you can find in your local health food store and I don’t think there is any recipe that call for more than five ingredients. Each recipe comes with tips on how you can customize the item to your lifestyle, needs and budget. This booklet is for the beginner and for the experienced. Honey Kissed Lip Balm – I know I’ve already posted a ‘chapstick‘ recipe, but this one trumps that, I feel. With only three basic ingredients, this feels so luxurious. I put it on every single day and not only does it keep my lips smooth and moist, but it smells and tastes just like honey! Body Butter – This was a fun one to figure out too. I took the basic Beeswax Lotion recipe, which you are familiar with and with one extra ingredient turned it into a sumptuous body butter. Making it into a butter and using safflower oil instead of olive oil, it becomes lighter and less greasy. Now I use it as a daily face cream and when my hair get frizzy I can even use it to tame fly-aways. I also discovered on Halloween, when I went a little overboard with the eye makeup, that you can use it as cold cream! It took every last smudge of sparkly eyeshadow, eyeliner and mascara off my eyes. Spicy Aftershave – A few years ago I tried making an aftershave for Scott that called for rum as a base. Not only did he walk around smelling like a drunk pirate, but he said it was sticky. This does not call for rum nor will it make the man in your life have a sticky face. Instead it will make his face feel refreshed after shaving and he’ll smell darn nice too. I’ve included two different aroma combinations with inspiration for creating your own. 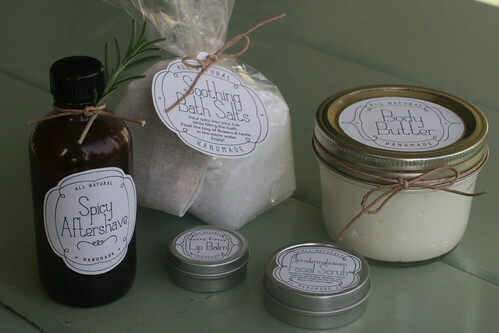 Bath Salts – Have you tried bath salts before? Boy do they make the bath a whole different experience. This recipe makes the water just a bit effervescent and you step out of your bath with softer skin and smelling oh so faintly of a flower garden. Lovely! Microdermabrasion Facial Scrub – A handful of years ago I bought a microdermabrasion facial kit that cost $50! It made my face feel soft, but it smelled of chemicals and for a little tube, it seemed pretty expensive to me! This facial scrub is every bit as good, but it smells of honey and lavender and my face really seems to glow after I use it. This recipe makes enough to use about a dozen times. I bet you have the ingredients to make this in your kitchen right now! Click here to buy this instant download pdf booklet! I have made the body butter and I love it. I have Sjogren’s Syndrome which is an autoimmune disorder that affects (among other things) the moisture of my body. This means I have very, very dry skin that hasn’t responded well to typical lotions or creams. However, your body butter recipe has helped a LOT. I gave some that I made to a friend and it has been the only thing that has helped with a persistent spot of flaky skin that she has. I plan on making the honey lip balm because that is the favorite type of lip balm my boyfriend and I like to use. I just have to get around to getting some containers. I was wanting to know if I could send you a money order?